Four US soldiers charged with murdering three detainees in Iraq smiled before shooting them, a military court has heard from a fellow soldier. Private First Class Bradley Mason told the hearing at a US base near the Iraqi city of Tikrit that one of the accused threatened to kill him if he talked. He also said soldiers had been ordered to "kill all the male insurgents" in the operation on 9 May of this year. 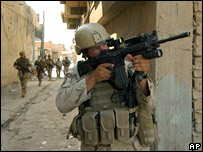 The incident is among a string of murder allegations against US troops. US investigators are currently looking at the deaths of 24 Iraqis in Haditha last November, and seven US marines and a navy sailor have been charged over the death of a disabled Iraqi man this April in Hamdaniya. Under US military law, a pre-trial hearing is being held at Contingency Operating Base Speicher to decide whether the charges against the four men warrant a court martial. Sergeant Raymond Girouard, Private First Class Corey Clagett and Specialists William Hunsaker and Juston Graber - all of the 101st Airborne Division - have been charged with premeditated murder and other offences. Some of them have also been accused of obstructing justice by allegedly threatening to kill Pfc Mason. Pte Mason told the hearing he was present when three men were captured in a house during a search operation at a suspected militant base near the Thar Thar Canal. Guns and ammunition were found in the house. Sgt Girouard, Pte Mason said, told him that Pfc Clagett and Spc Hunsaker were going to kill the prisoners. "They just smiled," said Pte Mason. "I told him [Sgt Girouard] that I am not down with it. It's murder." Pte Mason said he then heard shots ringing out. The accused say the detainees were killed trying to escape. Weeks later, when Pte Mason was preparing to testify about the day's events, Sgt Girouard allegedly accosted him, saying: 'If you say anything, I'll kill you." The 101st Airborne Division was at the time involved in Operation Iron Triangle, targeting insurgents active in Salahuddin Province and detaining hundreds of people. Pte Mason testified that the rules of engagement for the search operation on 9 May had been to "kill all the male insurgents". He said the rules had been set out by Col Michael Steele, commander of his unit, the 3rd Combat Brigade. "He [Col Steele] just said that the rules of engagement were that 'we get to kill all the male insurgents'," he said. Col Steele has reportedly signed a statement declaring his intention to refuse to testify in the case.